There’s nothing quite like a creamy, old fashioned macaroni salad recipe to bring back memories of summer. This is the Hellmann’s classic recipe my mom made with a few of her own tweaks. Shredded carrots, extra salad olives, tiny bits of chopped onion and celery all mixed with tender elbow macaroni and swathed in a creamy mayonnaise sauce. Is that how your mom made it? This post has been updated from my original post published in August 2010. I grew up on old fashioned macaroni salad dinners. In the summer my mom just didn’t cook a lot because of the heat. If it was the weekend dad would grill but during the week? We were likely to eat a cold salad. We were not big eaters. Meals were often just what happened to be in the fridge and could consist of cantaloupe with ice cream, or sandwiches, or strawberry shortcake, or the best macaroni salad ever. Seriously. Mom made the best macaroni salad. If you were still hungry afterward? Ah… the sound of my mom’s voice echoes through the decades…Grab a carrot. The answer to world hunger as far as my mom was concerned was raw carrots. Snack food? Carrots. Craving something? Grab a carrot. And you know what my kids hear when they are wanting a snack? Yep… Grab a carrot. Anyway, to me macaroni salad was summertime. I was a bit of a picky eater but I could put this stuff away. My kids can, too. 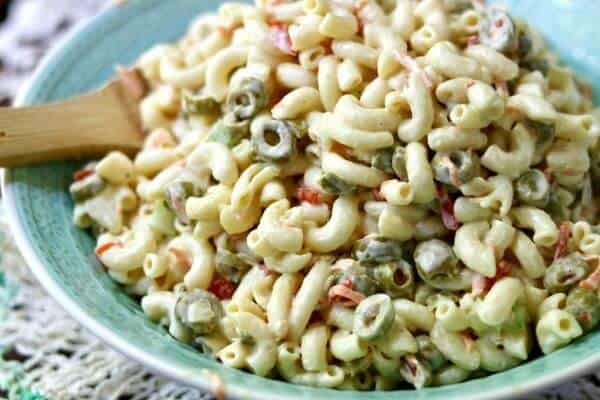 As far as I know this is the classic macaroni salad recipe that Mom no doubt cut from the paper, or package of something or other. She was not a creative cook so I imagine it is pretty much as written. I have considered updating it but I just can’t bring myself to mess with it. Macaroni salad is perfect the way it is. My mom told me that the secret of a the best macaroni salad was to overcook the macaroni. No al dente here, folks. Cook it until it is very tender but still holds it’s shape. It will soak up the flavor from the salad dressing that way. It is always better the second day so make it ahead of time if you can. Sometimes, when I am feeling particularly rebellious, I will add some chopped, fresh tarragon. This creamy salad is easy to make but here are some tips to make your old fashioned macaroni salad even better! Use salted water to cook the macaroni – about 2 tablespoons salt to 1 gallon of water. Slightly overcook your pasta. I know the directions say not to overcook it but trust me on this. Drain the pasta but don’t rinse it. Mix about 1/4 cup of plain mayonnaise with the macaroni to coat it and keep it from sticking. You can also use olive oil for this. Let it cool! If you add your vegetables to the hot macaroni they’ll lose their crispness. Always go by taste with the dressing. I use a lot more sugar than is called for in the recipe – I probably use 1/3 of a cup. Just to be honest – I double the salad olives because I love them. Let the flavors blend at least two hours in the refrigerator before serving. Overnight is better. You may need to add a little more dressing just before serving if the macaroni soaks up all of the moisture. Just be prepared to make more and stir it in. Always keep macaroni salad chilled in the refrigerator until ready to serve and cover and put leftovers back in the refrigerator promptly. I love this serving bowl! 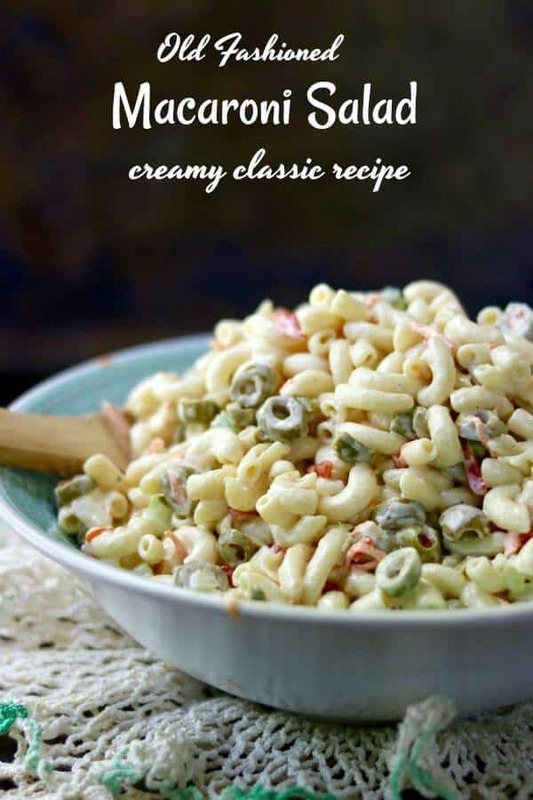 It’s such a refreshing color for summer and so pretty with this creamy macaroni salad inside of it! 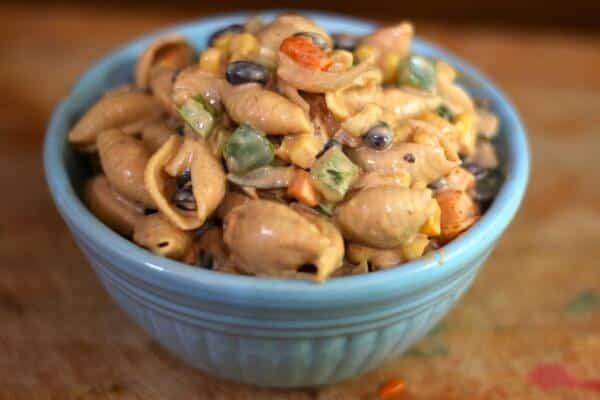 Looking for a vinegar based pasta salad rather than a creamy macaroni salad? 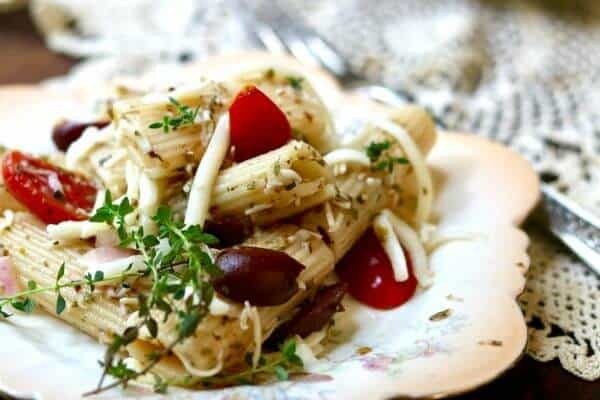 Try the Italian pasta salad! 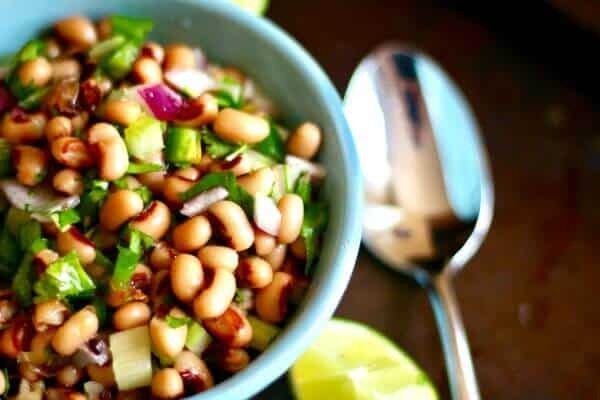 This recipe is best made at least 8 hours before you are ready to serve it. Make it up to 2 days ahead of time. 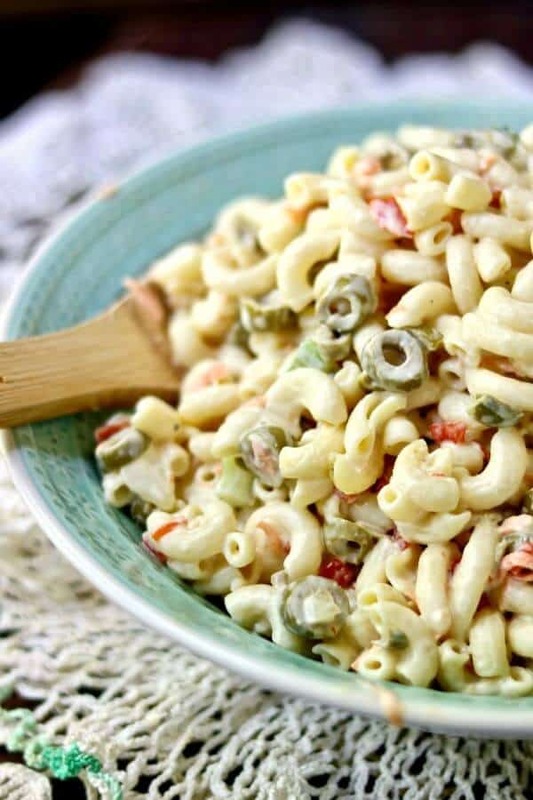 Old fashioned macaroni salad is summertime comfort food and is easy to make. You can even make it a few days ahead - it's best if it sits over night. Pour in macaroni and cook until very tender. Combine mayonnaise, mustard, vinegar, salt, pepper, and sugar and mix well. Taste and adjust seasoning. Put macaroni, celery, carrot, onion, peppers, and olives in a large bowl. Pour mayonnaise mixture over and combine gently. Chill overnight if time permits. I usually double the sugar and the olives because that's how I like it. Make this to your own tastes. OMG, are you kidding me right now? Made this as written, (halved the recipe) super delicious. It’s now my go-to mac salad recipe. Been eating on it for 3 days and am not tired of it yet. Bravo and thanks for sharing. Mmmmm! There is something about a classic like this that really makes you want more! This looks delicious! Thanks! Yep – I grew up on it so it’s big comfort food for me! Oh my, this macaroni salade is excellent it makes a change to mine, thanks! ?????? Me too, Aimee! I can eat way too much of this stuff! Reading that made my stomach growl. 🙂 My mom used to add small cubes of cheese and hard boiled egg. I made this as a side for dinner tonight. I only had green bell peppers, and I skipped the olives and used a fresh-picked tomato instead. I had to guess on the mustard — I wasn’t sure if you meant dry or prepared…so given the era it was from, I used prepared yellow. I liked it. One kid who prefers spicy brown mustard suggested that would be better. Another person who isn’t a fan of celery commented that maybe less celery. We must not eat as much as your crew because we have plenty left over. Glad you liked it Kathy! I had this as a 13 year old …My sister use to make it thanks for the sweet memories…and the recipe 2….. I grew up on it, Fran. Isn’t it funny how foods do that to us? I know you said you have never messed with it…but if a random person were to detest olives but like tomatoes, do you think tomatoes could be substituted for olives? Sure Kathy… Chop small – I think it would be amazing.